July 19, 2012  "We can look to the people in the middle or far east or in the middle of Africa saying to them 'America is the role model. 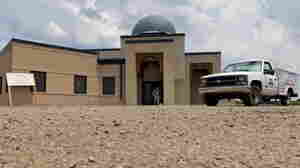 Try to learn from us in America,' " says Imam Ossama Bahloul. 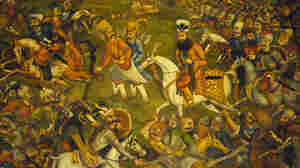 Opponents had tried to block the mosque's opening. Is NPR Doing Too Many Stories About Catholicism? December 20, 2011  Stories on the new Catholic liturgy prompted complaints that Catholicism is over-covered. Islam, Judaism and Christianity were in fact mentioned much more this year. A monthly average of three stories mentioning the denomination practiced by a quarter of all Americans doesn't seem out of line. 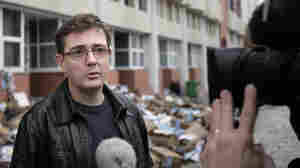 Charlie Hebdo's publisher, known only as Charb, talked to journalists today (Nov. 2, 2011) in front of his publication's burned-out offices. November 2, 2011  Charlie Hebdo's director calls those responsible "idiots who betray their own religion." June 28, 2011  Talk of the Nation's on the road at the Aspen Ideas Festival today. Michael Chertoff, John Negroponte, Jane Harman and Thomas Friedman talk about September 11, Michele Norris and Michel Martin talk across difference, and Imam Feisal Abdul Rauf talks about interfaith dialogue. March 10, 2011  "There is nothing radical or un-American in holding these hearings," says the chairman of the House Committee on Homeland Security. March 10, 2011  Melvin Bledsoe says his son was programmed by Islamic extremists to kill. The once joyful young man is accused of killing one U.S. soldier and wounding another in an attack on an Arkansas military recruiting center. March 10, 2011  The lawmaker, one of two Muslims in Congress, broke into tears as he spoke of the sacrifice made on Sept. 11, 2001, by a Muslim paramedic in New York — and the smears afterward about that man. Hear his remarks. March 10, 2011  The controversial session begins at 9:30 a.m. ET. It can be watched on the Web. March 8, 2011  M. Zuhdi Jasser says "the vast majority of Muslims are not radicalized, but we do have a problem." If the hearing helps show that American Muslims are trying to fix it, that could "melt away any bigotry that may exist out there."